Meyer Turku cut the first steel today for Costa's first LNG-powered ship, the second of seven ordered by Carnival Corp from the Meyer group. The complete story appeared in the September 13 edition of Cruise News Daily. Rendering courtesy of Costa Crociere. All rights reserved. May not be copied or used without express permission. Silversea signed a contract today with Fincantieri to build a sister ship to Silver Muse. The 40,700-ton ship will accommodate 596 in double occupancy. It will be built at Fincantieri's Sestri Ponente yard near Genoa for delivery in 2020. Carnival Conquest had the honor of being the first cruise ship into either South Florida port today. 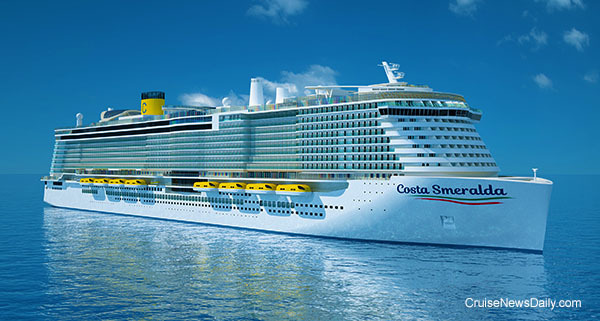 The complete story appeared in the September 12 edition of Cruise News Daily.